Today is the day of our annual pledge ingathering, a sort of Stewardship Sunday. 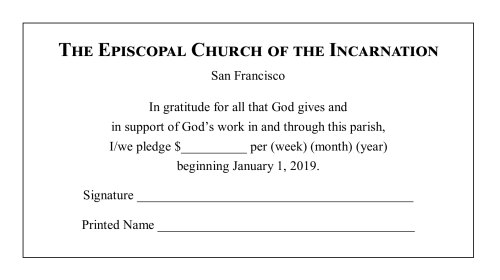 We fill out little cards each year, promising to support the church, and we offer these cards to God as a token of our gratitude. Likewise, Fr. Webber has donated an altar pillow to the church out of gratitude for the many years that God gave him with his wife Peg. After the Creed today, we will be dedicating this offering. 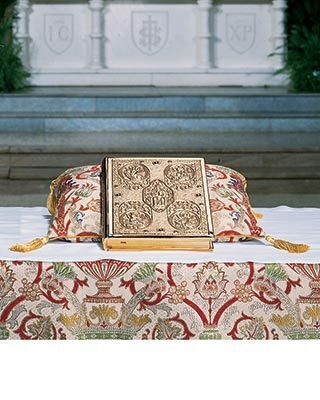 (And if you are wondering what an altar pillow is, think of it as an overstuffed book stand.) At first glance, today’s Gospel story of the healing of blind Bartimaeus seems like a bad fit for a day devoted to stewardship and gratitude. Well, folks, first glances can be deceiving! As today’s Gospel story begins, Jesus and his disciples, along with a considerable crowd, are leaving the city of Jericho, and a blind man, called Bartimaeus, is sitting begging at the side of the road. Now, in first-century Palestine, to be stricken by blindness was considered the ultimate catastrophe, because along with it came complete dependence on others. By their social standards, it was deeply shameful for an adult to be so helpless. Moreover, beggars of any sort were relegated to the bottom rung of the social ladder, having neither status nor honor. Being both a blind man and a beggar, Bartimaeus had two strikes against him.